California Democrat Rep. Barbara Lee is about as loathsome as it gets. 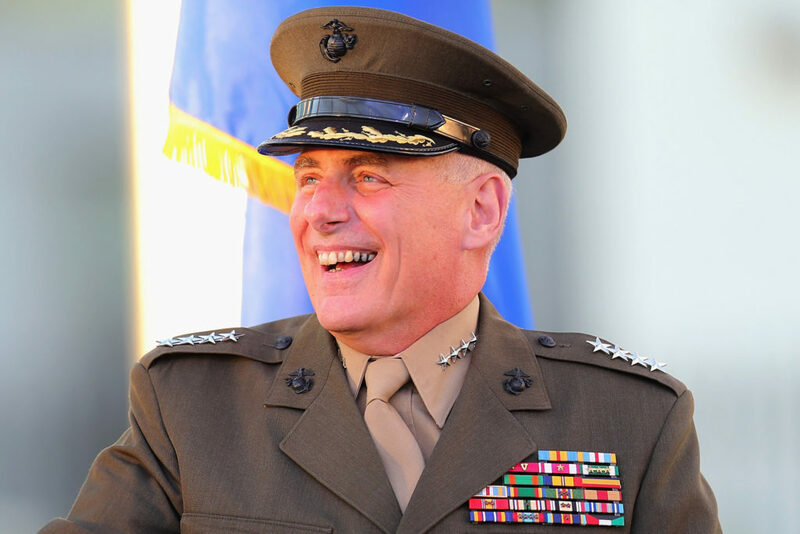 John Kelly enlisted in the United States Marines in 1970. He was discharged from active duty as a sergeant in 1972…at the same time Babs was volunteering at the Oakland chapter of the Black Panther Party. Kelly signed up for the Marine Corps’ Officers Candidate School in 1975 and was commissioned as a second lieutenant. He served aboard aircraft carriers USS Forrestal (CV-59) and USS Independence (CV-62). In 1984 he was put in command of a rifle and weapons company for the Second Marine Division. In 1987 he was promoted to major as a battalion operations officer. He served as head of the Offensive Tactics Section, Tactics Group in Quantico, Virginia. He was promoted to lieutenant colonel and was assigned as commanding officer, 1st Light Armored Reconnaissance Battalion (1st LAR), 1st Marine Division at Camp Pendleton, California. He then served as the Commandant’s Liaison Officer to the U.S. House of Representatives and was promoted to colonel. In 1999 he was transferred and served a special assistant to the Supreme Allied Commander, Europe. In 2002 he served with the 1st Marine Division as the assistant division commander, spending most of his time serving in Iraq. In 2003, while in Iraq, he was promoted to brigadier general, where he took command of the newly formed Task Force Tripoli and drove it north from Baghdad into Samarra and Tikrit. In 2007, he was promoted to major general. In 2008 he assumed command of the Multi-National Force–West in Iraq. He was transferred to the Pentagon in 2011 where he served as the senior military assistant to the Secretary of Defense. He then took over as commander of the U.S. Southern Command in 2012. On December 7, 2016, he was tapped to head the Department of Homeland Security. He has a Master of Science degree in National Security Studies from the Georgetown School of Foreign Service. If that’s an “extremist,” we need a helluva lot more extremists in this country! And a lot fewer Barbara Lees. P.S. Upon reading about Anthony Scaramucci being ousted as Communications Director shortly after Gen. Kelly officially took over as White House Chief-of-Staff, it was even more abundantly clear that Donald Trump, the Entrepreneur President, is no wishy-washy, indecisive Barack Obama. And the Trump Train continues moving forward to make America great again.